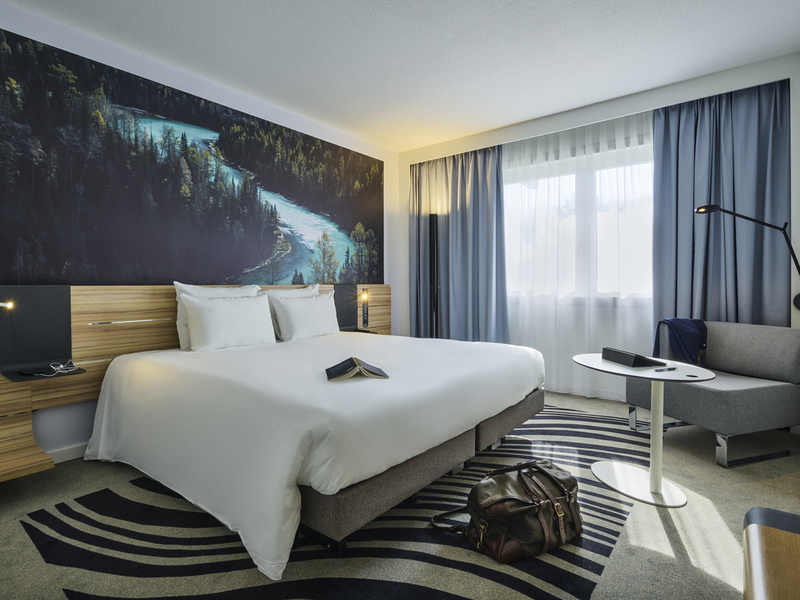 The Novotel Massy Palaiseau hotel is located 7 min from Massy RER and TGV train station and offers easy access to the A6 and A10 highways. It is also 7 min from the EDF campus as well as the Paris-Saclay technological campus and the Ecole Polytechnique. The Safran campus in Igny is less than 10 min from Novotel. The hotel is close to the Atlantis business district in Massy, with the offices of numerous international groups like Carrefour, GE, Nokia. The Opéra de Massy is less than 2.5 mi from the hotel. Receptionist at check-in showed exceptional service standard. Food in restaurant at dinner time a little limited (blackboard display in reception area totally unavailable) and wine by the glass even less (changing menu apparently). Room service breakfast good, but 15 minute window is too long and wasted time in the morning. Room and bedroom/bathroom facilities of very good standard. TV had no English channels but this was fixed once notified to receptionists on second day of stay. I encountered two serious issues this time: 1) The room was not clean. I had dirt on the floor and the table was sticky with grease in quite a few areas. 2) I asked to order a taxi in the night. Reception took a note but didn't do anything. I asked again before breakfast to confirm if the taxi was ordered. Reception told me &quot;yes&quot;. only after it was too late, the reception called the taxi company again and realized that nobody had called them. I missed an important appointment due to that. I also am convinced, that your hotel requires urgent renovation and is not adequately equipped for a 4 star hotel. The doors, room furniture, hallways, etc. are very old and in bad shape. I will not recommend your hotel further. Too much noise from a visiting Belgian rugby team - no supervision from team managers, parents or intervention from Novotel staff. poor service, old and spartian room, for expensive hotel. Quality of service at the restaurant is very poor, not organized and slow. Limited menu with poor food quality. Very old room, with minimum of comfort, service and stuff provided (minium bathroom product and linen, no slippers, ....). However the price of the room remains higher than other Mercure or Novotel Much more pleasant I use to stay in. The welcome at reception was simply awful. In fact there was no welcome, the receptionist spent 7 minutes on the phone before making eye contact. The room stank of smoke which the cleaning staff had attempted to resolve by leaving the window wide open. Finally, despite written discussion, the incorrect credit card was billed. Very poor service. We only found out when we arrived at the hotel that it was over booked and we could not stay. We had had booked and paid months before and were only told when we arrived at the hotel after a very long journey with 2 very tired small children. Good business hotel with friendly staff. Restaurant is offering good food and staff is very helpfull. Hotel has secured parking area. It's always nice to be expected and recognised. An iron and ironing board are essential to my accommodation requirements when traveling. I arrived late in the evening (unavoidable due to my travel schedule), and was informed that Irons and ironing boards are not provided in rooms as standard. Upon request I was informed that all of the hotels ironing boards had been given out already and to try again in the morning. In the morning it was the same answer - no irons available. The hotel was acceptable in other areas but without the provision of an iron and ironing board I have no choice but to mark my experience as highly unsatisfactory - I had to attend a very important business meeting the next day with an un-ironed short, looking very unprofessional, which affected my performance in the meeting and it's overall success. I travel every week and typically stay in one of the AccorHotels in Massy. In most hotels, this loyalty is acknowledged - with anything from an upgrade to a more personal service at check-in. I never get this at the Novotel ... which means I will always favour one of the other hotels in the chain. Once again despite being a gold member there were no room upgrades; i have stayed multiple times at this novotel and it has never happened; at the mercure nearby it is nearly standard. My A/C didn't work and nothing was done. Nothing done made my membership feel like it was worth anything. Laissez faire attitude from most staff. Very helpful staff. An enjoyable stay. Ok but not good for the cost. The hotel was very busy and the staff did not seem set up to deal with the guests. The wifi was very poor and could barely be received in the room i was given. The room was very noisy and close to a door that was either staff or guest but that banged every 15 mins.